We are filled with great joy to have all three of our sons home for Christmas, the first time we have all been together since June. Our oldest son, Eric, has been interested in cooking since he was a toddler, standing on a stepstool and helping me make peanut butter cookies, pancakes and other kid favorites. 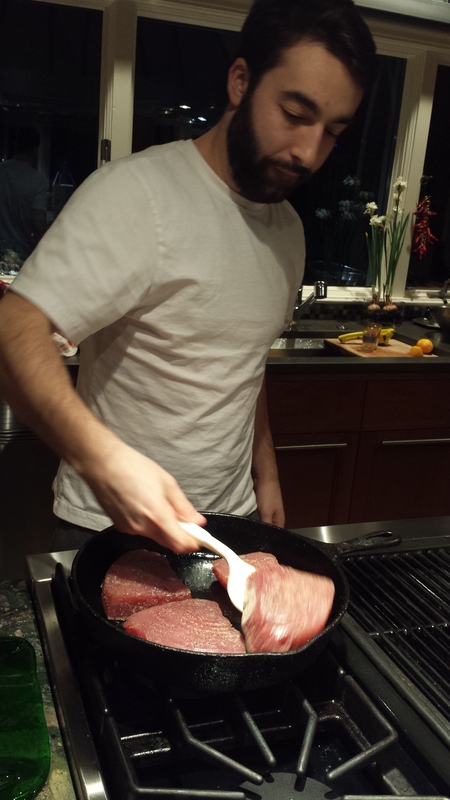 When he was older, he learned cooking basics from me and grilling techniques from his Dad. Then he moved out and has taken cooking to a whole new level. For the past several years, Eric and I have engaged in what I think of as friendly ‘cooking wars’, where we take photos of whatever gourmet meal we just made and text it to each other. Eric has created quite a reputation as a great cook among his friends and rightly so. I have had the pleasure of Eric’s famous Seared Ahi Tuna several times and am pleased to have him as the first guest chef for Good Mother Diet. Notes from the Chef – A dish like this is delicious, beautiful and looks decadent but is actually very easy once you get comfortable working with Ahi. 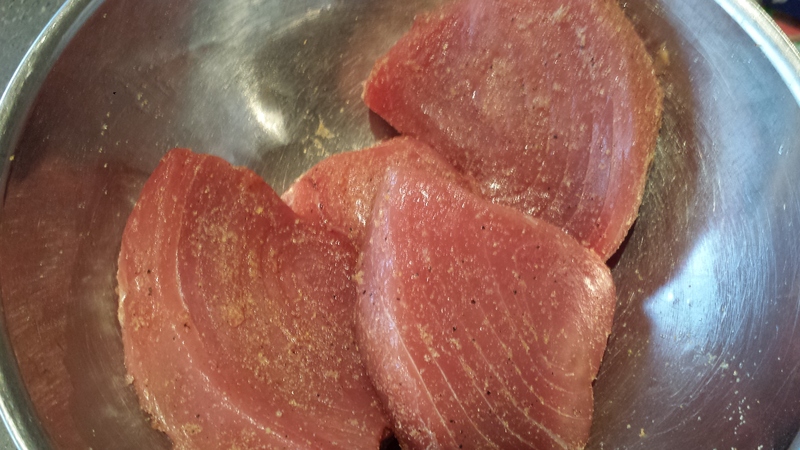 Ahi is a fish that is generally served raw to rare. People are sometimes are afraid of working with raw or rare fish, however if you buy your fish from a reputable local source, the fish should be good. Keep in mind that most if not all tuna is flash frozen on the boat which is a means to preserve the flavor and keep it fresh. Pickling the daikon takes out all the sharpness and adds a pleasant sweetness. This is best done days before but in a pinch, it can be done that day as well. Kept in the refrigerator, it only gets better and will last for 2 weeks. In making the dry rub for the tuna, I find that dry ginger works best in this dish rather than fresh, because it’s easier to blend evenly with the rest of the dry spices. 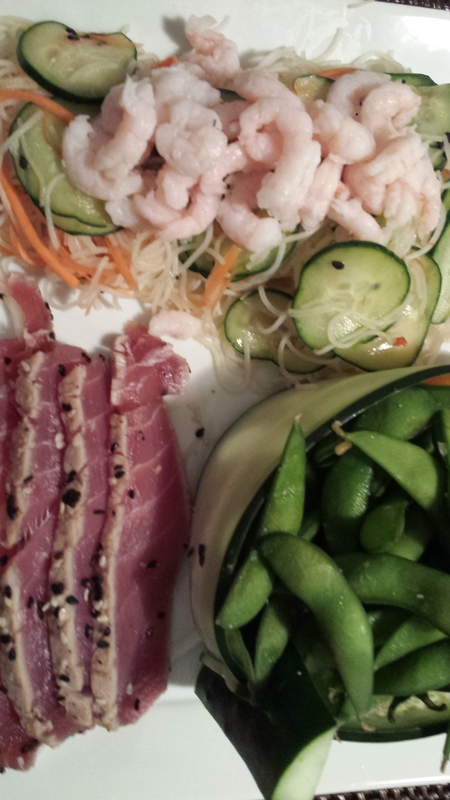 The hardest part of this dish is in removing what I call ‘the horn’, the fibrous tip on each piece of tuna. It’s easy to see what to remove when you look at the grain of the fish. There are two parts of the Ahi steak, a large piece where the grain goes one way and a small piece where the grain goes the other direction. You need to remove the small piece which is too fibrous for this dish. I hate to throw it out so I usually use it to make Ahi Poke. 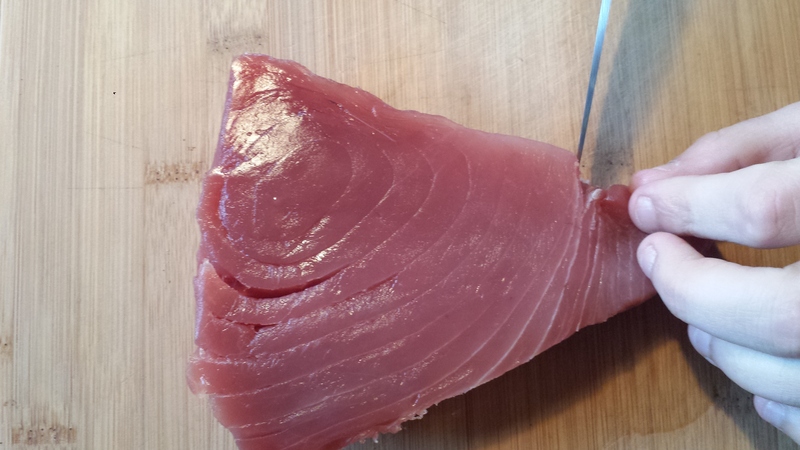 You can also make poke with a prime piece of tuna, which makes a prettier dish, but for our purposes, we are going to make use of the less desirable bits. 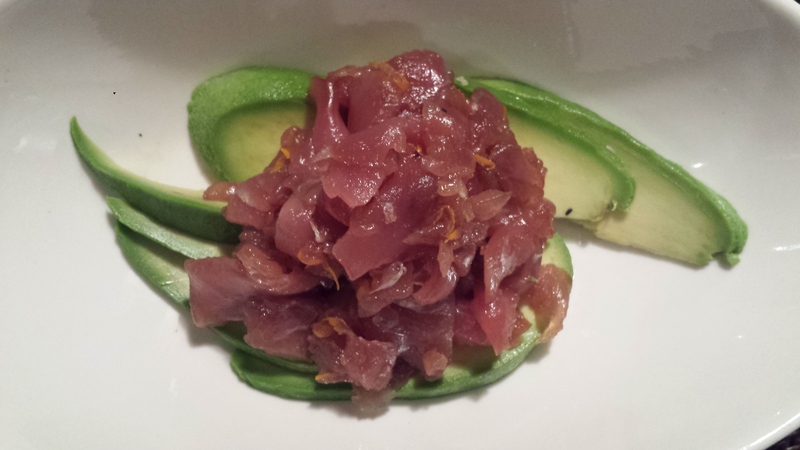 If I have one thing to say about Ahi tuna, less is more, because it is so good on its own. I believe that everything on your plate should look good and I like to use edible ingredients in my presentation. Using a mandolin or grater, shred the radish into long strips. Combine all dry ingredients in a medium bowl, or a pie plate. 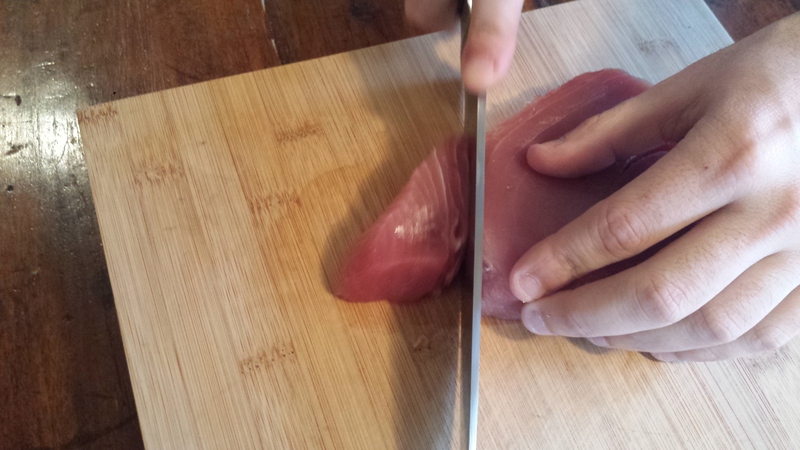 Place Ahi tuna on a cutting board. 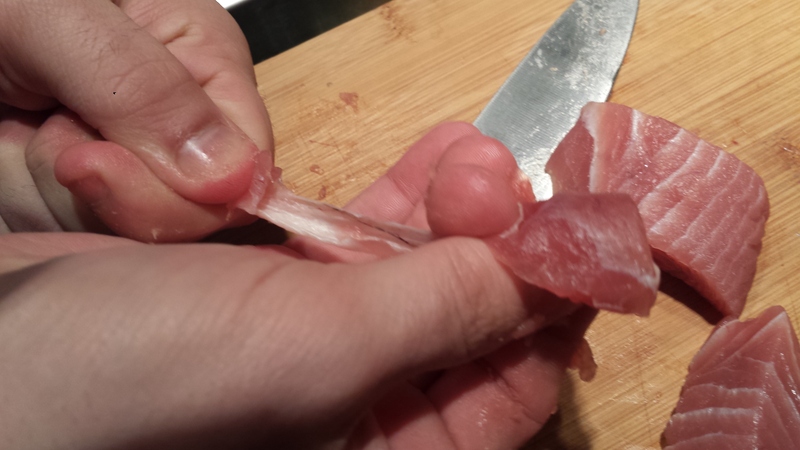 You need to remove the tough fibrous part of the tuna (the small tip section). 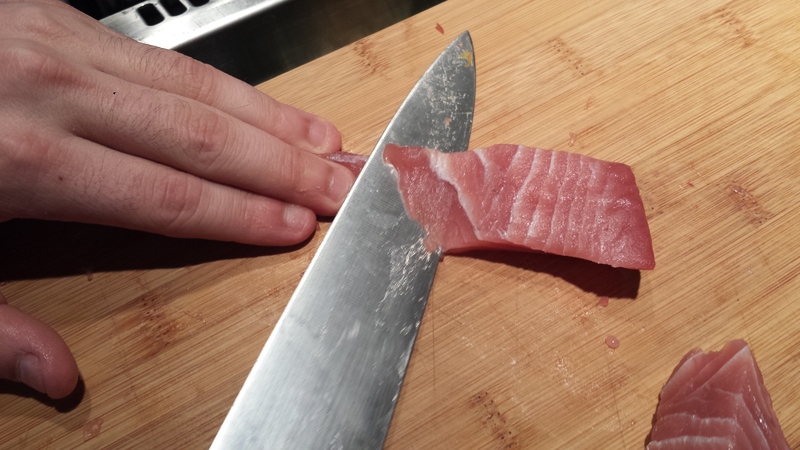 Using a knife, beginning at the ‘knotch’ where the grain of the fish changes, cut, as shown, taking care to remove the fibrous tissue. Reserve the small piece of fish to make Ahi Poke. Recipe below. Dredge each piece of fish in dry rub on both sides, including edges, and brush off excess. Add sesame oil to bowl and toss fish to coat evenly. Cover and refrigerate 1 to 2 hours. You don’t want it to come to room temperature before cooking. Make wasabi paste by combining one Tablespoon wasabi powder with 1 Tablespoon water. Mix and shape into a cone. Let sit ten minutes. Heat a heavy pan until it’s almost smoking. Sear the tuna 30 seconds to 1 minute on each side. Remove from heat and put in the freezer for 2 minutes. Remove from freezer. 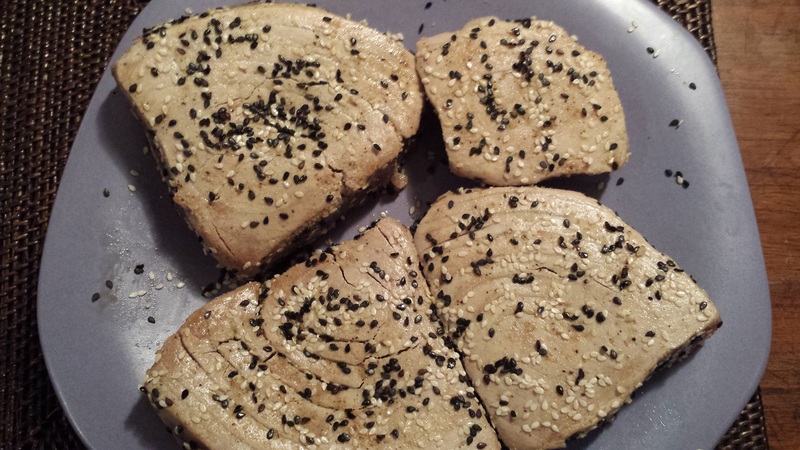 Press sesame seeds into both sides. Slice and serve. Working from the long end toward the tip of each piece, run the knife between the sections to remove the white fibrous tissue. You will need to use your hands to pull the meat off as well. Some of it will be small scraps. Cut the longer pieces into cubes. Put tuna pieces in a bowl. Add remaining ingredients and toss well. Cover and refrigerate. (Best if marinated overnight or 24 hours). Bring a large pot of water to a boil. Remove from heat. Add rice noodles and let stand 3 to 5 minutes, stirring occasionally. Drain and rinse with cold water until they are no longer hot. Noodles should be soft but firm. Gently press the water out. Set aside. Combine all ingredients. You may need to use your hands. 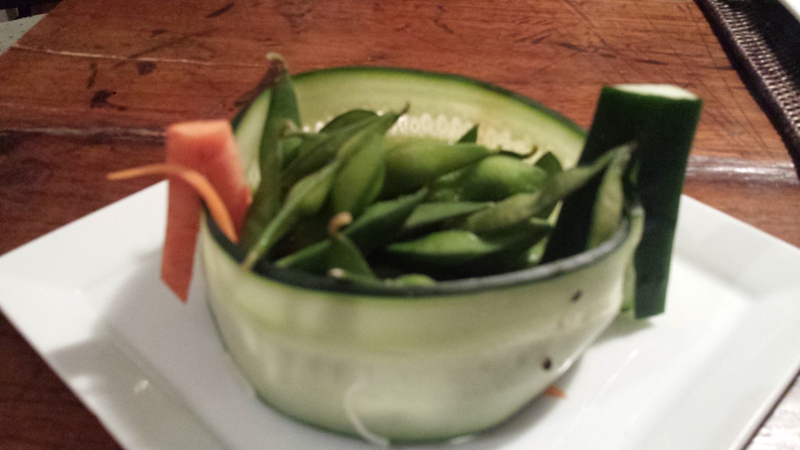 CHEF TIP-You can make a pretty cool dish to hold your edamame, or anything else, by shaving the side s of a cucumber on the wide setting. Form them into rounds and clip together with carrot or zucchini pins. Boil fresh or frozen edamame for 3 to 5 minutes. Drain and sprinkle liberally with salt. Serve. 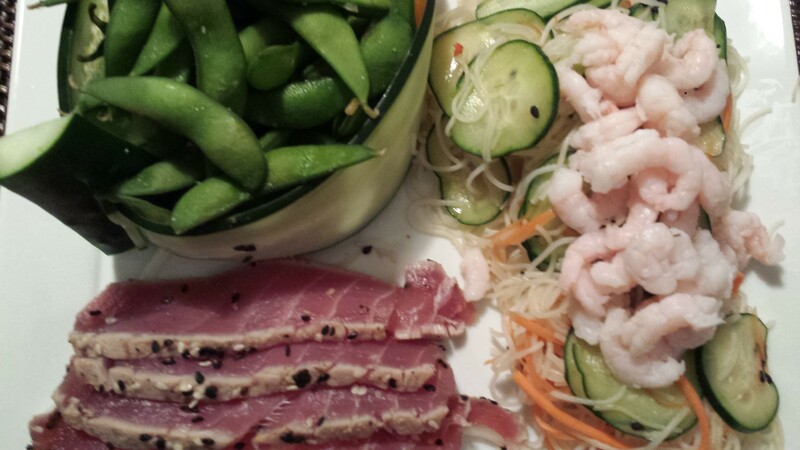 This entry was posted in All Recipes, Meatless Monday, Pescetarian, Wheatless Wednesday and tagged Ahi Poke, cucumber bowl, edamame, gluten free, Pescetarian, rice noodles, salad shrimp, Seared Ahi Tuna, Sunomono, Wheat Free. Bookmark the permalink.